Originally I was just going to post all my Chrestomanci reviews in one post, but it was so long that I decided to split it up into three posts instead! They’re paired in the same way as Volumes 1-3, so this is Volume 1: Charmed Life and The Lives of Christopher Chant. What can I say about this book that I have not said before? It is my favorite DWJ book ever, it’s probably my favorite BOOK ever, too, and basically it’s perfect. Everytime I read it I feel a little happier than before. So there. Like all books I massively love, it’s nearly impossible to say WHY I love it so much with any sort of specificity. I get all incoherent and ramble about the same things over and over again. I mean, I love the characters, the story, the writing, etc. and I love them SO much I can’t think of any reason why I do except for “because.” Because DWJ was an excellent writer, because this book has all my favorite things in YA stories in it, because I first read it when I was younger and no doubt there’s some nostalgia going on as well. It’s also just a very entertaining book– who among us doesn’t like “normal child goes to magical school” stories (Harry Potter!) and/or “ordinary poor child gets moved up into lap of luxury” stories (Little Princess)? Plus then you’ve got betrayal, conspiracies, interesting magical things, and even a bit of horror! Very exciting stuff, that. I think also I just love how DWJ wrote about children; they’re realistic enough that they have that feeling of realness to them, but they’re not SO realistic that you want to slap them (excepting the kids in Witch Week, maybe). DWJ’s kids make for good heroes/heroines, especially when they inhabit fun worlds like in the Chrestomanci stories. You end up rooting for them and wanting them to succeed in whatever they’re doing, and that’s a nice feeling to have when you’re reading a book. This one’s just as good as Charmed Life! 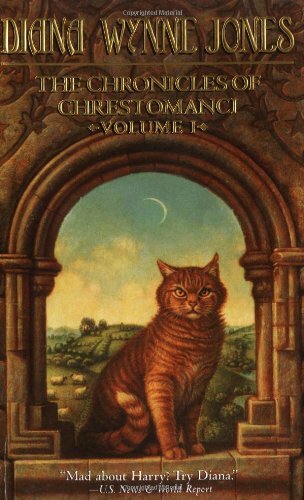 Plus you get to see what the Chrestomanci in Charmed Life was like before he was the Chrestomanci, in a way that isn’t annoying like some other prequel books have been (I can’t think of any now, but I know they’re out there). I also really like Millie; DWJ has a lot of good girl characters, ones who can keep up with the boys without BECOMING a boy, if you see what I mean. Maybe they’re a bit prone to crying moreso than the boys, but they’re good heroines nonetheless. TLOCC reminds me a lot of some of PG Wodehouse’s books, especially the early Psmith ones (Christopher kind of reminds me of Psmith, now that I think of it). There’s school, and cricket, and sneaking out of dormitories to go have adventures at night. At least half of the book is what you’d call a “romp,” I guess. Christopher doesn’t get to keep any close male friends which I think is a shame, but he gets Millie later on and she’s just as good, really. DWJ tends to write children with varied personalities, not all of them pleasant ones, but her adults almost always fall into the same two categories: nice/good adults and mean/bad adults. The nice ones pay attention to children, try to help without taking over the entire storyline, and generally behave like the sort of people you’d be happy to hang around with. The bad ones are neglectful, self-absorbed, uncaring, and (occasionally) downright evil. Sometimes DWJ went over the top with these archetypes (stereotypes?) and sometimes she stuffed a book full of either one type or the other (very little variance, in other words), which is kind of discouraging if you’re an adult yourself. If you can’t be the protagonist of a YA book any longer, at least you’d like to have a decent supporting role, amirite? TLOCC mostly has bad adults, although there’s one or two decent ones running around. The adult in Chrestomanci Castle drive me insane the most; it’s like none of them have even MET a child before, let alone helped raise one. Surely these people have nieces/cousins/younger siblings/something?? No wonder Christopher becomes all snooty and vague– he HAS to, just to get through to them! And then he carries on that whole thing when he’s an adult, which makes me wonder how he views other adults. Get your own copy @ Amazon or BookDepository.com and support Here There Be Books through the power of affiliate earnings! Or find a copy in your local library and support people other than me! So about the adults in Christopher Chant — I thought one of the major strengths of that book is the way that DWJ makes your perception of the adults shift dramatically, when Flavian (I wrote Florian initially! GOD. It has been way too long since I read this book and i should never have left it in Louisiana) fusses at Christopher for being so unfriendly. It made me, at least, view the other adults in Chrestomanci Castle very differently — that they had found Christopher unbelievably nasty and unfriendly, and that was why they all seemed cold and unfriendly to Christopher. And you also get to see why Gabriel de Witt was the way he was. And I don’t know. I think the adults come out pretty sympathetic in the end, and that’s why Christopher sort of emulates that kind of environment when he becomes Chrestomanci (except his castle is friendlier really). But I can see how they situation would escalate, especially if they thought the Castle was the most awesome thing ever and why is this ungrateful child glaring at us all the time. But still. I enjoyed both books a great deal, but I definitely have a preference for The Lives of Christopher Chant. I think that Christopher is a much more developed, interesting character than Cat, and one with a stronger personality. For me, the plot was accordingly more interesting than that of Charmed Life (for all its obvious charm!). While I won’t deny that the adults in The Lives of Christopher Chant are rather distant, I think that the strengths of Christopher and Millie as characters far outweigh any other possible faults. Christopher definitely has a stronger personality than Cat– probably because he didn’t have an older sister shoving him down all the time. 😀 But yeah, even in The Pinhoe Egg, Cat’s very quiet. I don’t mind that, personally, but Christopher’s books tend to be more electric/exciting in some ways than Cat’s books.